Across The Ice–The Greenland Victory March premiered on Servus TV on March 5th in Germany, Austria and Switzerland. 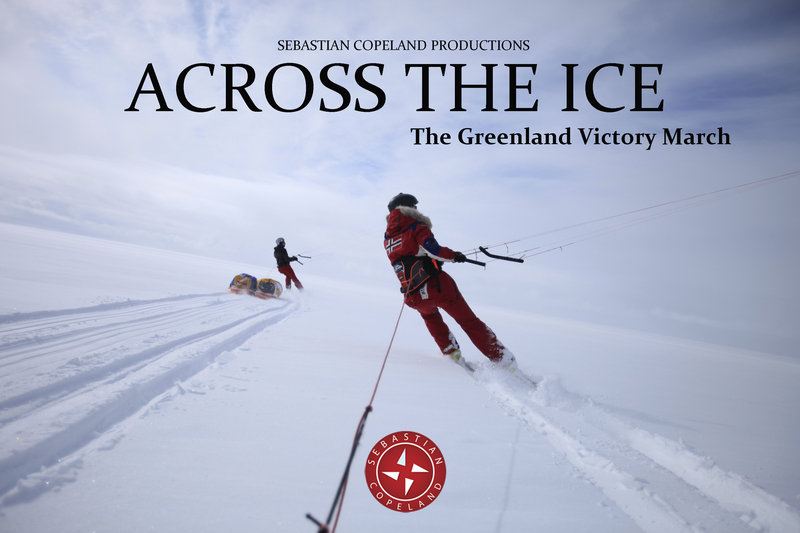 The film chronicles Sebastian Copeland and Eric McNair Landry’s record setting kite skiing mission across the south-north axis of the Greenland ice sheet. The film marks Sebastian’s second directorial effort and his first collaboration with Red Bull Media House. Set mostly on Greenland, the film follows training sessions in Iqualuit, and the 2300 kilometer unassisted journey which includes getting pinned down by hurricane strength winds; a tour of the cold war relic DYE II; and setting the new world record for the longest distance travelled in 24 hours by kites with 595 km. Across The Ice will be presented at Cannes’s 2014 MipDoc for international distribution in early April. You see watch the trailer here. Stay tuned for other international releases. We have just watched your journey through Greenland with Eric. Portuguese TV is a bit late in their films! We were fascinated by your wind-power. Our comment is this. How could the American Early Warning System building simply be abandoned in such a disgusting state? It should be mandatory that the place is cleaned up and all the mess removed. One has to leave Everest clean these days. I know the building was left some years ago, but the Americans should be made to go back to clean the place up and leave it clean and usable for such people as yourselves. The dome in itself is wonderful and worth visiting by tourists if such people are allowed into such areas. The place could be made into a Tourist destination, but the people who built it should be made to clean up and remove from Greenland all that they brought in, including the vacuum cleaner and men’s magazines. I think I have repeated myself several times.